7 Paintings in 7 Days - Create-A-Thon 2017 update. Though I haven't been specifically focusing on one creative activity for a weeklong period at a time recently I have been making lots of sketches, taking lots of Instax photos and thinking about other creative ideas. This past week, I decided to paint 7 paintings in 7 days - 5 x 7 size mostly, with acrylics, using my own photographs as reference. Brenda and I also spent one day at Rehoboth Beach and painted outside at Cape Henlopen State Park. 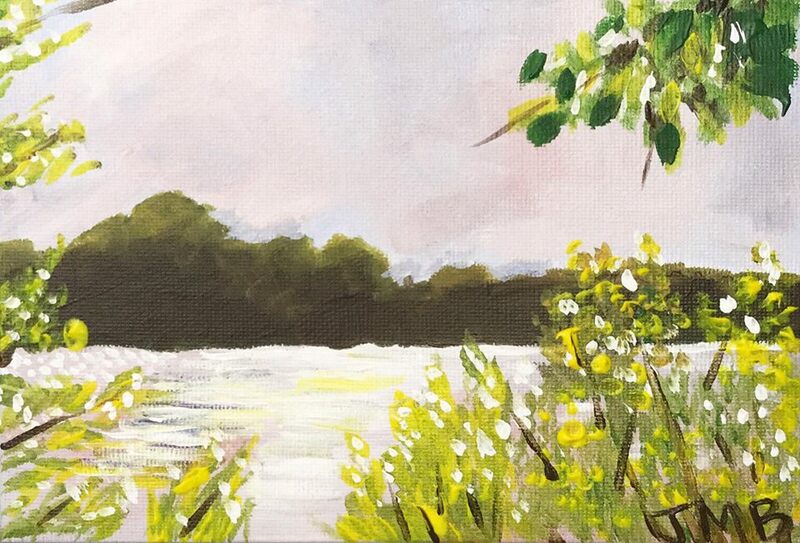 I really enjoy painting landscapes, and want to work toward painting them in an impressionistic style. I like painting outdoors and would love to be able to do that more often, but it's just not possible with my current daily commute. Some evenings, it was hard to pick up the brush to get started, but I think that painting daily is the way to improve, no matter whether you feel like painting or not. I think that I would like to expand on this activity and try painting daily for 30 days, not necessarily creating 30 paintings, but that could be my goal. The key would be to work in a small size, such as 5x7, or 5x5. I also have some miniature canvases, that could be fun too. 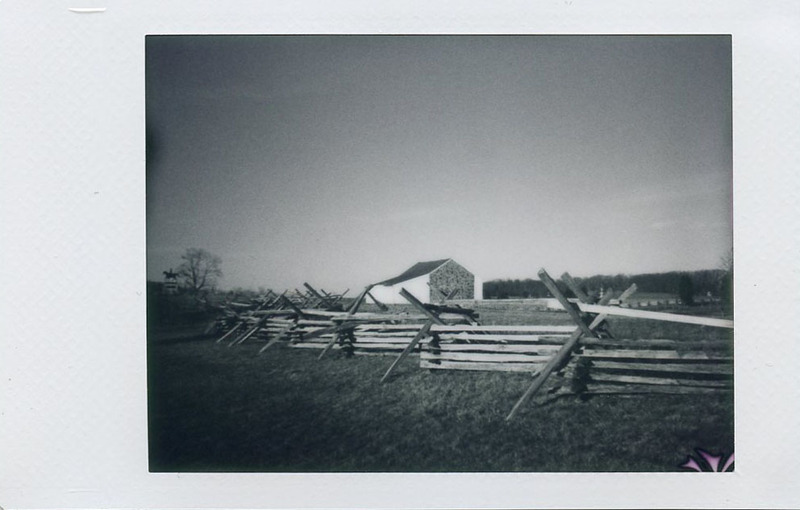 26 Instax Packs - #3 - Diana F+ with Instax Back using Fuji Instax Mini Monochrome at Gettysburg National Military Park in early evening. The exposure was a bit unpredictable and hard to get right, but there are interesting effects on the corners of some of the prints. Week 51 - Kodak Brownie Fiesta Camera in original box with exposed roll of film found by a friend in a Goodwill Store in West Virginia. I successfully developed the roll of film and posted about it previously in "A Visit To Summersville Dam". The Kodak Brownie Fiesta is a simple point and shoot plastic camera using 127 roll film that was made in the early 1960's. I had another roll of Triple Print Film that I had purchased in a lot from ebay to use in the Fiesta camera. The last roll turned out pretty well and I was hopeful this one would as well. Nearing the end of my year long 2016 film camera project, I've found it difficult to find the time to finish it up with the hustle and bustle of the holidays. I started the roll in the beginning of last week by stopping on my way to work at the MICA campus on Mount Royal Avenue in Baltimore. I grabbed a few shots there and then in my hometown to finish up the roll. The camera is very easy, just frame up the shot and press the button. The camera makes a sort of springy sound when the shutter fires, seeming like the photo would come out blurry. The photos seemed to come out in focus, but the quality of the shots was not as good as the previous roll. I had some difficulty removing the tape at the end of the roll of film in the changing bag and ripped the corner off one of the frames. 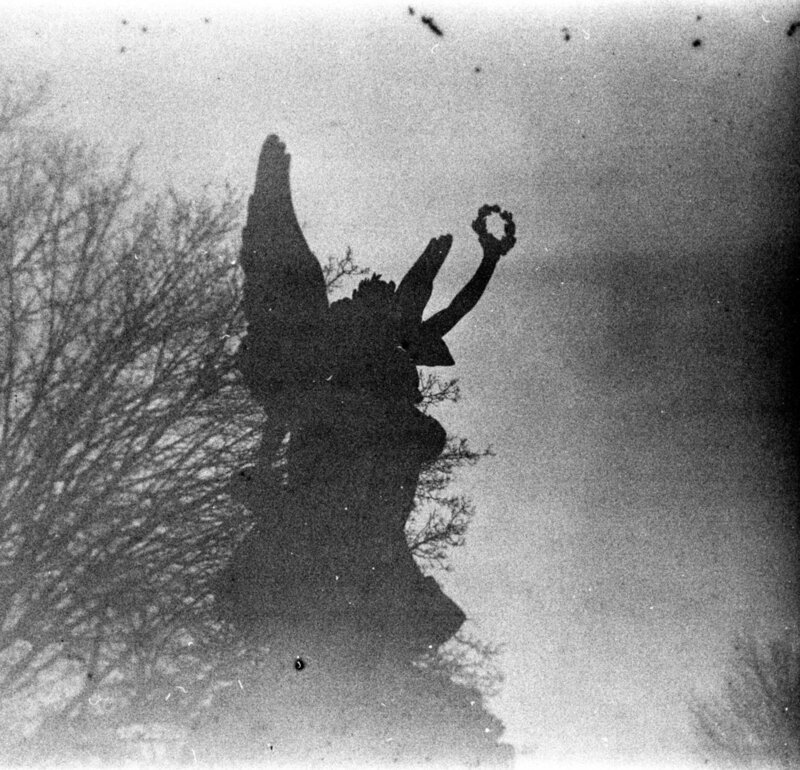 I developed the roll in Kodak D-76 stock solution and scanned the negatives with Epson V500 Photo. Week 50 - Spartus 35 with leather case purchased at the Black Rose Antique Mall in Hanover, PA for $12. I was drawn to this simple camera with the sans serif font spelling out the name around the lens, on a day that I was hankering to buy another camera. I didn't want to spend much money but wanted to find a nice little usable one to wind down my 2016 film camera project. The Spartus 35 is well, a 35 mm camera, made by the Herold Company of Chicago. It has a lens with focusing from 4 feet to infinity, time and instant lever, and aperture settings of Bright, Hazy, Cloudy, and Dull, with a tripod mount on the bottom. I loaded the camera with Film Photography Project's FPP EDU 200, but when I turned the film advance knob, it kept turning, so I wasn't sure how many frames had been advanced until I noticed the film counter dial rotating as I was advancing. 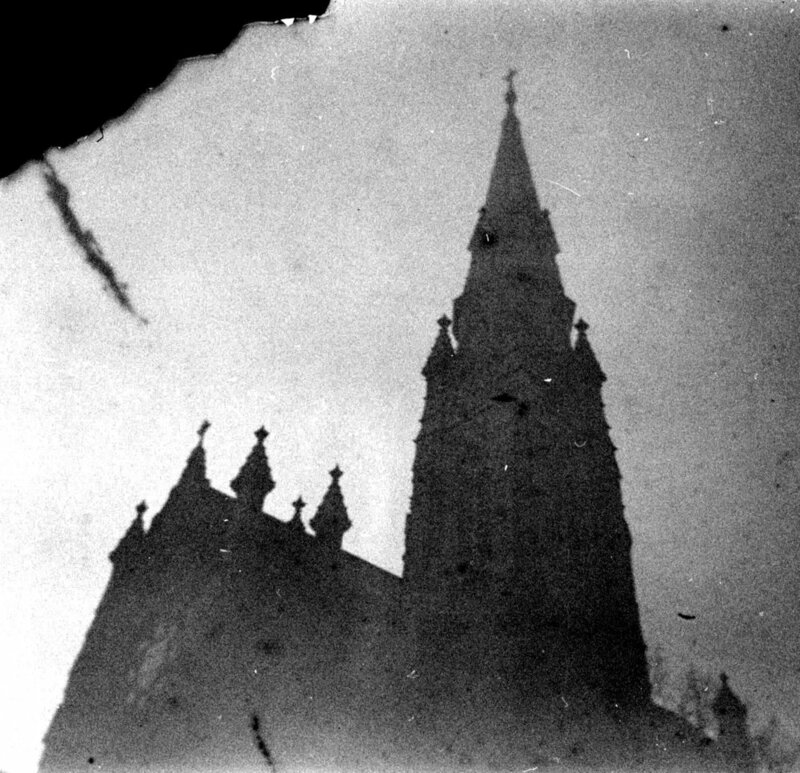 The film is supposed to advance one frame at time with a sprocket release button being pressed to advance to the next frame. 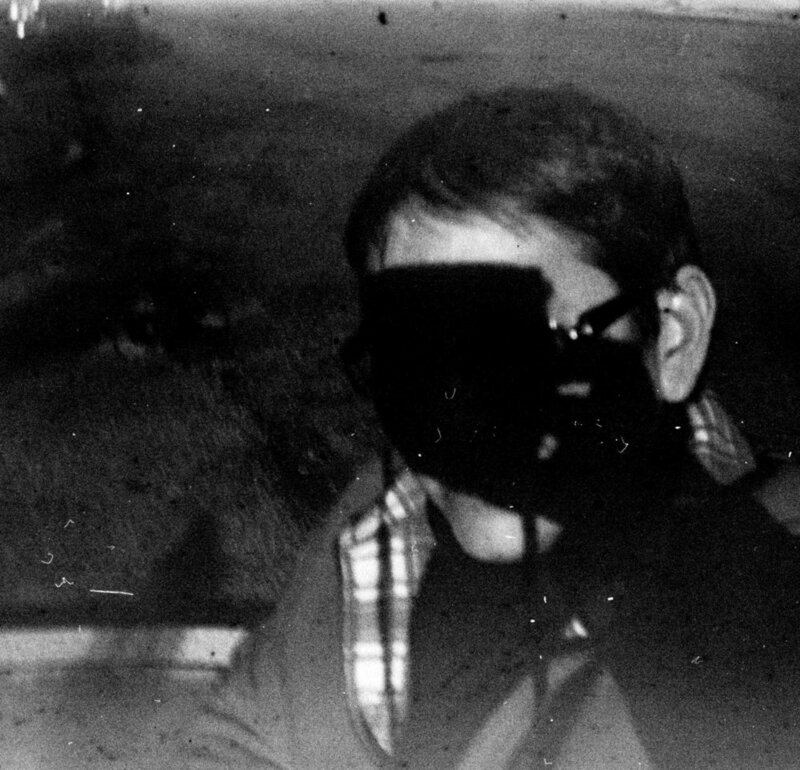 This one apparently was not working, but I correctly observed that the film dial turned one full rotation between frames but unfortunately I had wasted a half a roll of film or so by then. I managed to get 10 frames out of this roll on a nice lunch time walk around my office in Baltimore. It's getting increasingly difficult to find fresh material to photograph within a lunchtime walking distance around my office, and its too dark by the time I get home in the evenings to go out and shoot. I do still enjoy photography with the various cameras that I've been using this year, but as the year is winding down to a close, I feel that my project will also be closing at the end of the year as well. 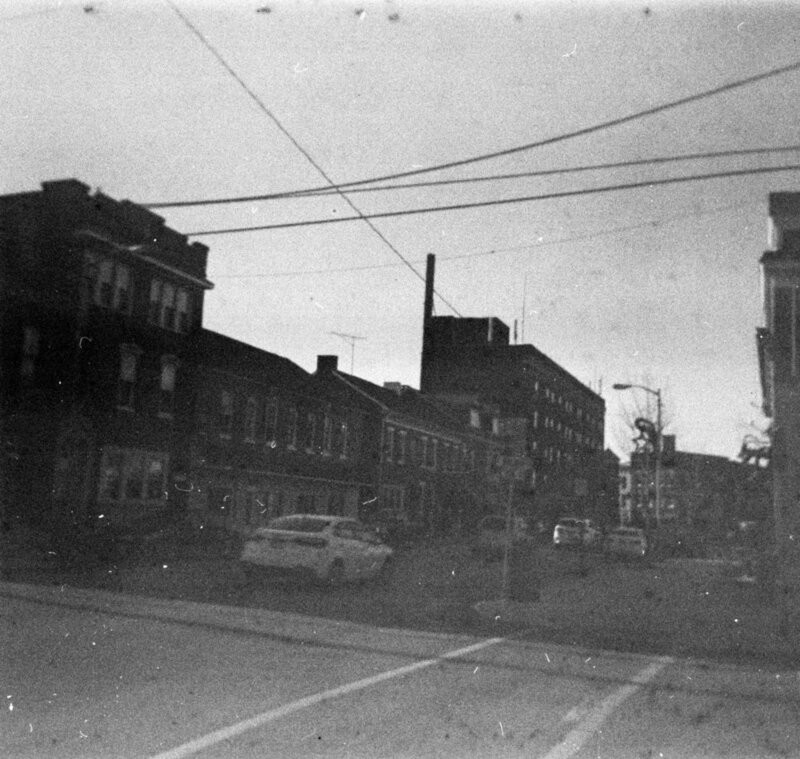 I developed the roll in Kodak D-76 stock solution for 9 minutes and scanned the negatives with Epson V500 Photo. I think the photos came out nicely exposed with sharp focus where I correctly guessed the focusing distance. Week 49 - White Bora Bora model of the Lomo'Instant Automat I received as a Kickstarter reward. This is an instant camera using Fuji's Instax mini film format which features a 60mm f8 (35mm equivalent) lens. The Automat has a fully automatic shutter with a +1/-1 exposure compensation button, bulb setting (up to 30 seconds), and the ability to shoot unlimited multiple exposures. It also has a tripod mount and there's a remote in the lens cap to trigger the shutter for selfies or to shoot long exposures with the bulb setting. It has zone focusing with three focusing distances on the lens - portrait, group and mountain (infinity). The flash can also be turned off, and there are flash gels to add color to your flash photos. My camera also came with Fisheye, Wide Angle, and Close Up lenses as well as a Splitzer accessory. I have the previous model of the Lomo'Instant from the first Kickstarter, which I used in week 45, a camera that I've had for two years and enjoy shooting, but I wanted to get this new model hoping it would have better exposures. I found the Automat to be a little lighter and smaller than the original Lomo'Instant, and so far my impressions are that it has better exposure quality. The two have different lenses, which means that I'll be keeping both of them (I really just love all instant film cameras!) The Automat also has the nice added feature of the shutter remote in the lens cap. 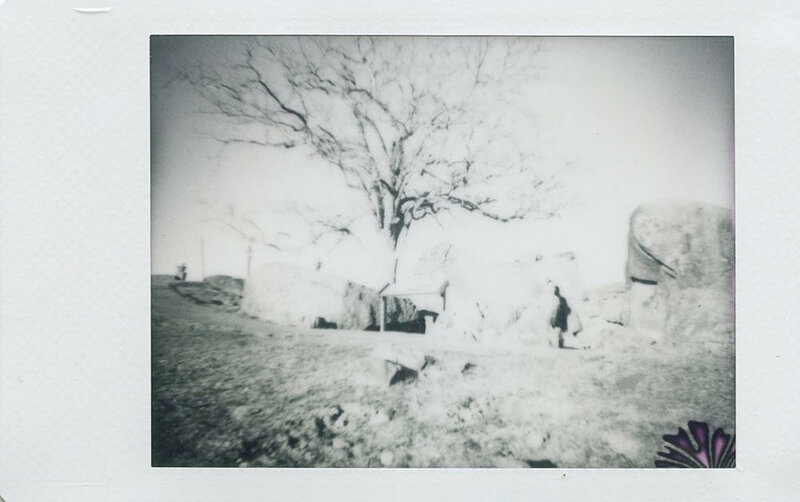 I had ordered a boatload of Fuji Instax Mini film from ebay in anticipation of receiving the Automat - the new Monochrome, Black Frame and Sky Blue Frame. There is a treasure trove of unique film borders to be found on ebay for Fuji Instax Mini film if you're into that sort of thing. I found the outdoor shots with the Monochrome to be very contrasty in bright sun, but I really liked it with the close up lens on a slightly less sunny day. The Black Frame is nice with outdoor color shots and I think it looks great with brightly colored subject matter. The Sky Blue frame looks nice as well, looking pretty sweet on a close up photo I shot of silvery Dusty Miller still standing in my front garden. The focusing on the Automat seems pretty accurate if you use the guidelines in the enclosed brochure for the focusing distances for zones and for each of the lenses. There is less vignetting on the photos than in the original Lomo'Instant. I have not had a chance to fully test all the features, but my first impression of this camera is that I love it already - light and compact to carry around, nice features to give you some control over your photos, and better exposures than the original Lomo'Instant. I think I'll be diving into the world of Fuji Instax Mini frames available on ebay, they all look so tempting! Week 48 - Kodak Brownie Starmatic from my collection, purchased with a roll of exposed film inside. I had developed that exposed roll of film and found only a couple of multiple exposed frames with a woman's face and a minivan. The Kodak Brownie Starmatic uses 127 roll film and features auto exposure with a fixed focus lens. The film speed can be set with a dial on top of the camera and exposure can be set to auto or adjusted with the EV (exposure value) dial on top of the camera. The film that I chose for this week was an unidentified color film with England printed on the wrapper. After opening it, the metal spool was rusted, who knows how the film had been stored over the years. Wondering what I would get from the photo results with such a sorry looking roll of film and an untested camera, I ventured out on my lunch break on a brisk, late fall day last week. Not knowing the speed of the film, (I guessed it might be a 100 speed color film) I set the film speed on the camera to 50 and the the EV dial to auto exposure. I went for walk down to the Inner Harbor in Baltimore on this bright sunny day and shot a few photos along the way. I got a few of the usual touristy photos - the U.S.S. Constellation, Ripley's Believe It Or Not Museum, and the Water Taxi with the National Aquarium in the background. I really was not confident that I would get any images on the roll of film, but I did enjoy going on that photo walk on such a nice sunny day. I had mixed up a fresh batch of Kodak D-76 the day before developing and eagerly took the whole camera into the changing bag, just in case there were any snafus with the film roll. I usually have some difficulty spooling older 127 roll films onto the Paterson reel, the rolls are so tightly wound that it's difficult to get them started. I developed the roll of film for 10 minutes with my usual method (room temp developer - I don't take the temp), water stop bath, 5 minute fixer, rinse and then generic film rinse aid from Freestyle Photo. This method works for me (varying the developing time with each type of film) so I haven't experimented too much with different temps and developers. I use D-76 or Caffenol for black and white films, C-41 for color, and I've taken a stab at E6. I was very pleasantly surprised at the quality of the photos I got from this roll of film, the auto exposure on the camera worked pretty well for this unidentified film. After developing, I hang the negatives from a clothes hanger with clothespins on the ceiling light fixture in my studio to dry, then scan the negatives with an Epson V500 Photo flatbed scanner. Photos are then spot dusted in Photoshop with levels adjusted. I loaded the camera with Fujicolor 200 film and carried it along for a visit to see my mother-in-law. 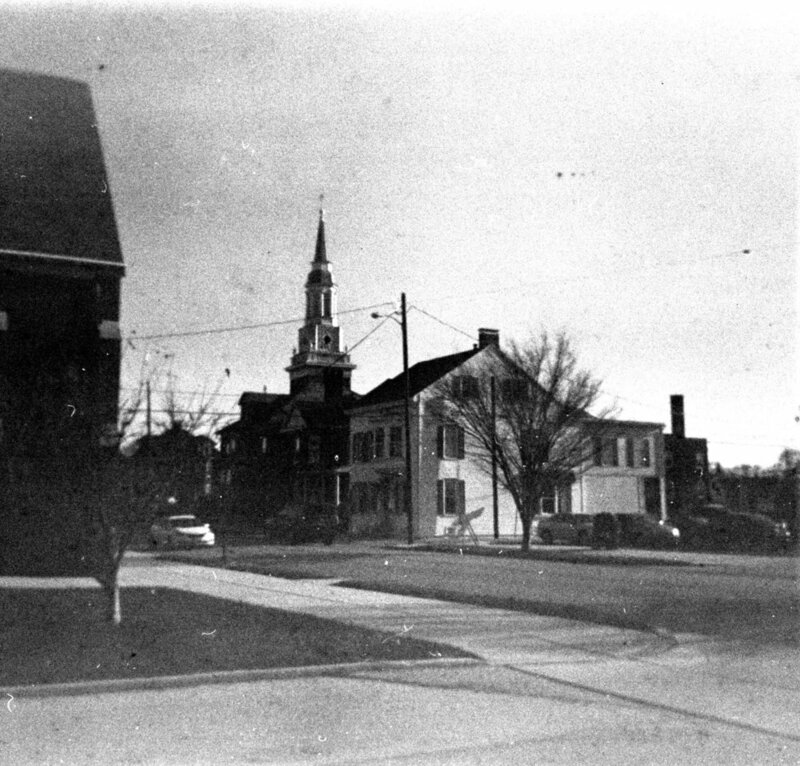 We decided to go to Elizabethtown for the annual Christmas parade, though, my heart was not really in it with my mother's recent passing. I thought I would try to get a few snaps of my great-niece and nephews in the parade, but we were facing the sun, which I think hindered the auto-focusing and auto-exposure on the camera. The close-up shots that I took of Brenda and her mom came out much better, I may want to try this camera with some black and white film with the subjects closer to the lens. The roll was processed with Film Photography Project C-41 Kit (which I'm hoping will finish out my project before needing replacement) and scanned with Epson V500 Photo. Week 46 - Kodak Pazzazz 110 Camera that my stepfather found while going through his desk, which he then gifted to me (along with a few other lo-fi cameras). A web search for information on the Pazzazz indicated that it was manufactured in Mexico, but the model I have shows a "Made in U.S.A." stamp on the top. The camera came in two colors, rose and turquoise, and was a very simple 110 load, point, and shoot camera. There is an on-off switch for the flash, requiring two AA batteries. I had not been shooting on the project for a couple of weeks as I was taking care of my mother in her battle with breast cancer and I was heartbroken when she passed two weeks ago. It's been hard to pick it up again, but I want to finish the project so that I can start the new year with hope for a less painful, loss-filled one than of 2016. My father passed in early spring, then our beloved family pet beagle, Cinnamon, two weeks later, and now my mother. Even though my parents have been divorced for many years, and I had been very distanced from my father, both of my parents had a significant, meaningful impact on my life. My stepfather had been going through some things, and found a few cameras that he thought I might like, and this little pink (fushia?) camera was in the bunch. The name simply called out that I shoot with it, and I still had a fresh roll of Lomography Lobster Redscale 200 110 film to load it with. I had returned from work after being on family leave and wanted to get back into my routine of walking at lunch break and shooting photos of the city. 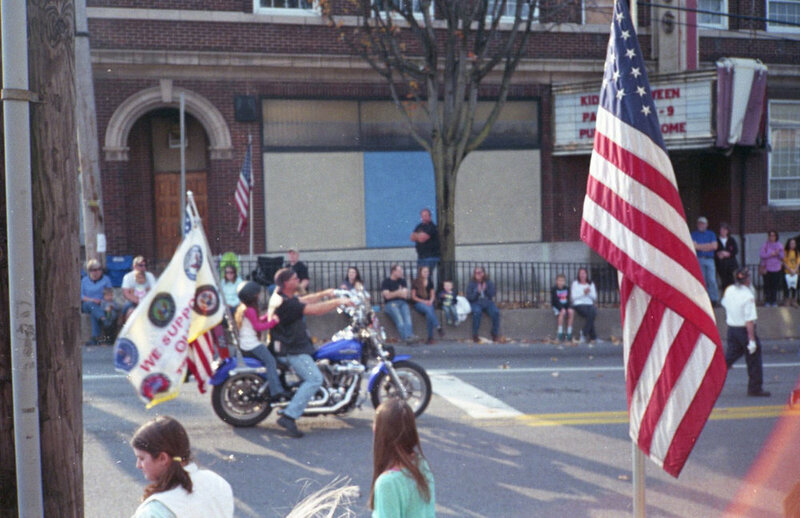 I shot the entire roll of film on my lunch hour that day, but I admit, I wasn't very discriminating in my compositions. As you can see in the resulting photos, this camera with this film requires lots of light, perhaps I should have saved a few shots to use with the flash on the camera. The film was processed with Film Photography Project C-41 kit and scanned with Epson V500 photo. Week 45 - Lomo'Instant Camera received as a Kickstarter reward two years ago. I decided to use the Lomo'instant this week in anticipation of receiving another Lomography Kickstarter camera in a few weeks, the Lomo'Instant Automat. I thought I could compare the new camera with this older model. 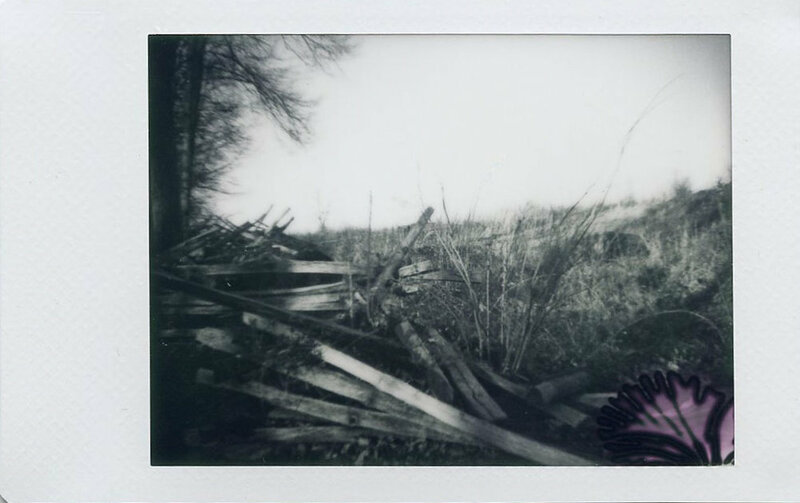 Last Saturday was a beautiful Autumn Saturday and I was eager to get out and shoot some instant film. I loaded my Lomo'Instant with expired Polaroid 300 film and headed over to Lake Marburg at Codorus State Park. The trees were in full fall color and the temperature was just slightly cool. Today, I was mainly focusing on capturing the fall color in the changing leaves of the trees at the park. I was looking for good framing and the right exposure. I tried a couple of multiple exposures and a selfie as well. Later in the evening, I took a portrait of Brenda with the attachable portrait lens using the automatic flash setting. I also grabbed two flash photos of our cats, but they were both overexposed, possibly because of their very light fur color. Brenda's flash photo came out fine, but the same settings with our cats, not so well. That's what I mean about this camera - I think that I've got it figured out, but then something throws it off. Overall though, I am pleased with the way the photos came out, most of which have a little vignetting in the corners, an effect that I like with the Lomo'Instant photos. I'm really looking forward to the new Lomo'Instant Automat, hopeful that it will be much improved over the original Lomo'Instant. I'm also eagerly awaiting my order of Fuji Instax Mini Monochrome film from B&H Photo. I ordered a few packs with the intention of using it with the new Lomo'Instant Automat.